Main Stone: One 3mm Round Stone Max Ring Width: 11mmWidth: 4.4mm.With intricate details such as a ro..
Max Ring Width: 8.5 mm.Centreed with a traditional Claddagh motif and embellished with an open Celti..
Main Stones: Two to Three 4mm x 4mm Heart Cut Stones Max Ring Width: 12mm Heart Cage: 10mmx9mmx5mm M..
Main Stones: Two to Three 4mm x 4mm Heart Cut Stones Accent Stone: One 1.25mm Round Stone Max Ring W..
Max Ring Width: 7mm.Two bands surround a wreath of celtic knots in this ring. 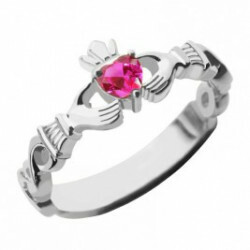 Personalise this caref..
Max Ring Width: 12mm Band Width: 4.6 mm.This classic Claddagh style ring is the perfect Celtic acces..
Total length of ring on finger, approx 0.9cm 1. Ring size comparison in different countries (..
Max Ring Width: 7 mm.This ring features a 7mm band styled with a repeating recessed Celtic design. P..
Centre Stone: One 4mm x 4mm Heart Cut Stone Accent Stones: Twelve 1.25mm Round Stones Max Ring Width..
Main Stone: One 4mm x 4mm Heart Cut Stone Max Ring Width: 8.5mm.The Claddagh ring is a traditional I..
;Style: Name Ring Width of Ring Band: 3mm/0.12" Thinkness of Ring: 1.2mm Material: 925 Silver M..
Main Stone: One 4mm x 4mm Heart Cut Stone Max Ring Width: 7.5mm Min Band Width: 3.0 mm Max Band Widt..
Main Stone: One 2.5mm Round Stone Secondary Stones: Two 2mm Round Stones Max Ring Width: 9.15mm Min ..
Max Ring Width: 8mm Min Band Width: 3.0 mm Max Band Width: 4.0 mm.An understated take on the traditi..
Main Stone: One 4mm x 4mm Heart Cut Stone Accent Stones: Ten 2mm Round Stones Max Ring Width: 9mm Mi..
Main Stones: Three 2.5mm Round Stones Max Ring Width: 12mm.This Celtic knot ring is adorned with thr..
Max Ring Width: 12mm.This classic Celtic knot ring can be inscribed with the names of loved ones. Pe..
Max Ring Width: 8mm Min Band Width: 3.0 mm Max Band Width: 3.6 mm.Combining our most popular styles ..
Max Ring Width: 10.5mm Band Width: Min: 1.5mmMax: 2.8mm.Featuring a flat heart-shaped centre decorat..
Main Stones: Three 2.5mm Round Stones Max Ring Width: 10mm.Three beautiful gemstones are gripped bet..
Main Stones: 17 1.25mm Round Stones Max Ring Width: 11.5 mm.Fashioned with a Celtic motif wrapped in..
Main Stones: Two 2.5mm Round Stones Max Ring Width: 9mm Min Band Width: 2mm Max Band Width: 3mm.Ther.. Accent Stones: Ten 2mm Round Stones Max Ring Width: 9mm Min Band Width: 3.0 mm Max Band Width: 3.5 m..
Main Stone: One 2.5mm Round Stone Max Ring Width: 8.5mm.The Claddagh ring is a traditional Irish jew..
Max Ring Width: 8.5mm.This classic design is inspired by the traditional Irish Claddagh Ring, which ..
Main Stone: One 2.5mm Round Stone Max Ring Width: 6 mm.The bypass design contains a 2.5 mm gemstone ..
Main Stones: Two 2.5mm Round Stones Max Ring Width: 7 mm.Containing two Celtic symbols, each set wit..
Max Ring Width: 12 mm.Fashioned with a large, high polished, fancy open Celtic design. Personalise t..